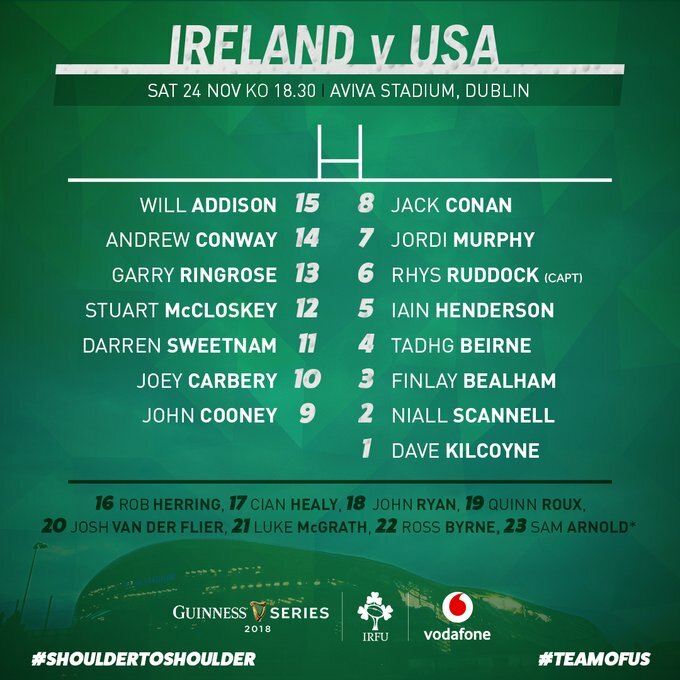 "Men's Eagles named for final battle of Autumn Internationals 2018 with No.2 Ireland"
Clearly they're trying to “big up” the task faced by the Eagles, but perhaps “Ireland, recent conquerors of the All Blacks” would have done a better job of that? But that's just little ol’ me being a picky fan. When it comes to Joe's matchday squad for this final November fixture, that result will have to be put aside. And from 1 to 23 this is a very interesting Irish selection. Stand out names for me are two in particular, both former Leinster prospects, and both of whom are in unbelievable club form that would pretty much guarantee test selection in most other nations. First there's John Cooney. I harped on him only the other day but I'll repeat myself - he has done more than enough a Ulster to earn his shot at an Irish green jersey…all he needs to do now is show he can both replicate that form and stick to the Schmidt script. When it comes to Tadhg Beirne, I reckon he'd have a lot more latitude when it comes to going out there and doing what he knows best. He certainly knows how to impose himself on matches and this gives him a perfect platform for just that. One area that will certainly be under scrutiny is the lineout. Iain Henderson has taken on a lot of calling responsibility of late and with himself, Beirne, Ruddock and Conan as options, Niall Scannell certainly has plenty of quality targets. I'd be disappointed with anything less than 100%. Another starter of interest is Stu McCloskey. Joe said it himself at the team announcement…few are in doubt of the Ulster man's crash ball prowess but it will be in other areas of his game where he'll need to prove himself. I'm guessing it will be on the defensive side of things where he'll need to be focused, and with Ringrose beside him I'd be surprised if much got through. 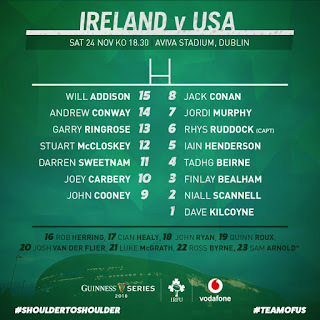 At out half I raised an eyebrow when Joey Carbery got the start as it seemed a good chance to give Ross Byrne his sea legs but then again, I suppose we need to take every chance we can to let our presumptive main backup 10 run the show,. On the USA side of things, although I was born there many moons ago, I must confess that I know very little about their lineup…I was kind of banking on AJ McGinty to be fit to have much to say about them! I do know their half back pairing of Davies and Magie play together at the Denver-based Glendale Raptors who got to the inaugural Major League Rugby final where they lost to Seattle Seawolves, who don't appear to be represented in the 23. We will have heard of Samu Manoa, who is now with Cardiff Blues and will surely make an impact from the bench. As for our own replacements, I reckon Sam Arnold might consider himself unlucky not to get the start at 13 but Joe has (quite rightly) spoken very highly of him so maybe if we can build up a decent lead he can get a prolonged spell on the pitch. The bookies have set this Irish selection quite a challenge, tipping us to win by 37 points. Despite the fact that the Eagles are currently on a test winning streak, I really do think we do need to be hitting that kind of margin. Experience of games like these has told me that we might be nervous coming up to half time that enough breakthroughs haven't been made, but even if so we should be able to pull away in the second half. In the spirit of Thanksgiving week I'll predict a smaller winning margin of 30. 23. Ryan Matyas - San Diego Legion.